If you have read my previous post, you will know that I attended a candle course with Can to Candle in Edinburgh. 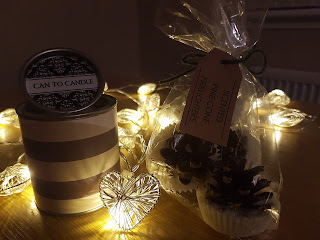 A lot of the scents that were provided on the course were festive scents and although I absolutely love those scents, I wanted to choose something a bit different for my candle so the scent I decided to go for was Wild Mint. Now I know what you are thinking, why would you want a candle that smells like Polo Mints?! And you'd be right, I for sure wouldn't want the smell of hot polo mints in my house! I actually had to look at the bottle again to make sure I had chosen the right one, it smells NOTHING like the kind of mint I was expecting. Instead what I can smell is a fresh herb like scent with a hint of fruit. Described by the manufacturer as a "true-to-life fragrance with fresh-crushed garden mint, infused with a hint of white tea." This candle would be incredible in a bathroom! Even without burning it, just leaving it in the room with the lid off to create a subtle freshness it is stunning. I feel a sense of accomplishment having made this candle myself, and I'll be reminded of that each time I look at it. Go and have a look at Kerry's candles, they are beautiful! Or if you are looking for something to do, or for a unique gift, take a look at her candle workshop - she sells gift vouchers too! What a cute idea! I'd love to make a candle of my own! Thank you I just love candles! I think they jazz any space up. You should take a look at Kerry's courses, it's a great opportunity to make your own. Thanks for looking at my blog. I'll head over and take a look at yours, always enjoy the opportunity to read other bloggers posts.